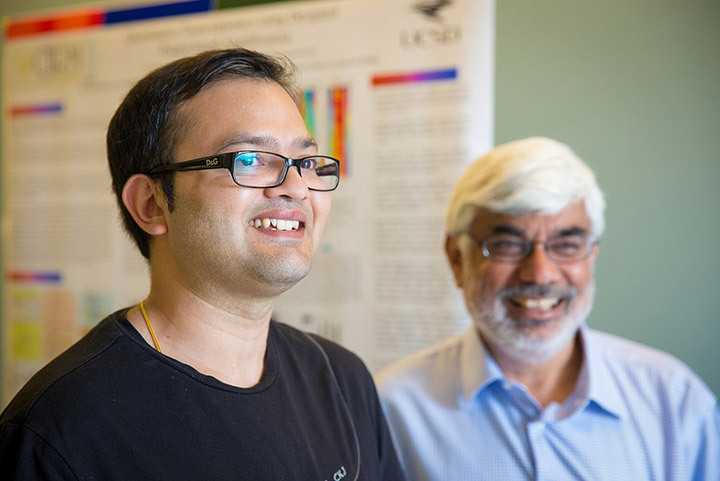 From left, Vipul Bhargava recently completed his Ph.D. at UC San Diego, where he worked in the lab of Shankar Subramaniam. Bhargava is the first author on the Nature Scientific Reports paper. Bioengineers from the University of California, San Diego have created a new method for analyzing RNA transcripts from samples of 50 to 100 cells. The approach could be used to develop inexpensive and rapid methods for diagnosing cancers at early stages, as well as better tools for forensics, drug discovery and developmental biology. The protocols, which were published in April 2013 in the journal Nature Scientific Reports, are now being applied to a wide range of biological and medical research questions from brain cancer, to liver function and stem cell biology. The approach from the UC San Diego bioengineers is called Designed Primer-based RNA sequencing or “DP-seq.” It’s a new tool for generating comprehensive snapshots of RNA — the “transcriptome” — collected from as little as 50 picograms of RNA. Analysis of the transcriptome provides insights into what biological processes are occurring at a specific moment in time. RNA transcripts serve as a proxy for which genes are being expressed and at what levels. “In the months since we published the DP-seq protocol, there has been tremendous interest from the scientific community,” said Shankar Subramaniam a bioengineering professor at the UC San Diego Jacobs School of Engineering and the corresponding author on the paper. “When you are not restricted to samples of thousands of cells, there are so many more system-wide gene expression questions you can ask, and answer,” said Subramaniam. Questions like: What transcription factors will determine cell fates, such as cancer versus normal? and what pathways are likely to be activated in a tissue upon treatment with a drug? Despite the small amounts of RNA inputs required, the DP-seq protocol preserves the relative abundance of RNA transcripts, even for low and moderately expressed transcripts. In addition, DP-seq can be used to target amplification of specific, medium or lower abundance RNA transcripts by reducing amplification of highly abundant RNA transcripts. With targeted amplification, researchers can gain insights on the low and moderate frequency RNA transcripts that can get lost in the amplification process in other protocols. “One of the exciting things about our protocol is that it has the potential to perform targeted amplification of genes of interest and/or specific regions of the transcriptome which carry disease-causing mutations or SNPs. Selective amplification of these transcripts will allow massive multiplexing of the samples, opening the door to cost-effective diagnostics,” said Vipul Bhargava, a graduate student in the Subramaniam laboratory and the first author on the paper in Nature Scientific Reports. In August 2013, Bhargava completed his Ph.D. in bioengineering at UC San Diego. 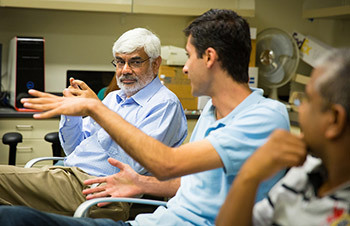 Shankar Subramaniam (left), a bioengineering professor at the UC San Diego Jacobs School of Engineering in a meeting with members of his lab, which focuses on bioinformatics, systems biology and systems medicine. He is the corresponding author on the Nature Scientific Reports paper. To demonstrate this selective amplification, the researchers designed primers that suppressed amplification of highly expressing ribosomal transcripts in embryonic stem cells of mice. This, along with high sensitivity and the large dynamic range offered by DP-seq, uncovered RNA transcripts that had previously only been detected in later stages of embryonic development known as germ layer segregation. “The majority of the novel transcripts that we identified in our study were low expressed. The high sensitivity in quantification of those transcripts and the large dynamic range offered by our protocol — over five orders of magnitude in RNA concentration — allowed us to detect the expression of these transcripts,” said Bhargava. The DP-seq protocol is one of several approaches developed over the last two years capable of generating transcriptomes from approximately 50 picograms of RNA. The new protocols from UC San Diego, however, offer distinct advantages, the researchers say. For example, by using 44 heptamer primers for cDNA amplification, the DP-seq approach generates transcriptomes faster and more economically than approaches that rely on full-length cDNA amplification of extremely small RNA samples. The researchers hope to develop their technology for routine diagnosis of pathologies as well as for discovery of mechanisms and targets for therapeutic interventions. A patent has been filed for this technology, which is available for licensing. For more information, contact invent@ucsd.edu. DP-seq is a next-generation sequencing-based approach to whole transcriptome analysis. At its base is one of the central dogmas of biology: DNA is transcribed to form RNA which is then translated to generate proteins — which may be modified before the proteins carry out their prescribed tasks. Analyzing which RNA transcripts are present, and at what levels — transcriptome analysis — provides a snapshot of system-wide gene expression patterns and a state of the system. “If you want to address a particular disease, the days of just looking into one gene, one protein or one signaling pathway are over. You need to look at all levels of complexity, all the way from genomic DNA to RNA to proteins, as well as how different modifications happen at the RNA and protein levels,” said Bhargava. Approaches like DP-seq, which provide quantitative data on gene expression levels system-wide, are part of a shift toward “systems health” in which researchers build systems-level models that describe biological phenomena and explain what causes disease. Once you identify genes that are changing their expression patterns, you can investigate how these genes are interacting with each other and build networks. Through these network models, you can begin to understand how specific changes within one network can affect the overall system. Understanding how perturbations in a system cause disease can lead to new therapies. “I am excited to see all the recent activity in the area of systems health. So much of it is built upon systems biology, and researchers from all across UC San Diego played key roles in creating systems biology,” said Subramaniam. Traditionally, in biology, researchers looked at individual parts — molecules, tissues, physical measures such as cholesterol, or individual physiology readouts like systolic and diastolic pressures. This is analogous to looking at parts of an automobile rather than looking at the automobile as one functioning entity. In contrast, engineers are trained to look at how components integrate to give systems-level properties. Researchers at UC San Diego were some of the first to bring rigorous principles of engineering and systems-level thinking to the study of biology and medicine. Subramaniam, for example, was highly involved in a large-scale collaborative grant from the NIH National Institute of General Medical Sciences (NIGMS) that focused on cell signaling. This was the first systems biology project to focus on mammalian systems, and it brought together UC San Diego researchers from engineering, medicine, life sciences and the San Diego Supercomputer Center. The early research raised questions that led the researchers to ask — and find ways to answer — questions from a systems-level perspective such as how data from the ever-growing list of “omics” tools (such as genomics, proteomics and transcriptomics) can be integrated in order to build models of biochemical pathways and mechanisms that will help explain healthy physiology as well as disease. Researchers across UC San Diego are currently using these types of models, and other advances made possible by systems biology, in order to treat diseases, find new drugs and understand how organisms work at the molecular level.